When it comes to engineering, sometimes the mind just never turns off. Even problems around the house, in Do-It-Yourself mode, tend to get (perhaps) more thinking than they should. My wife is amazingly supportive, but sometimes even she says I think too much about it. Today, Mother Nature tested engineering design for us. The back entrance of my home has a stairway down. Whomever put it in failed on one very important point: there is not a drain at the bottom. When it rains, the stairwell fills with water. It’s deep enough to handle some rain easily, but the big storms fill it, and water comes under the door to flood the basement. Not good. It’s the same with Snow. Blizzards in Colorado fill depressions like the stairwell completely. There are many solutions to this kind of problem, such as jack-hammering out the bottom and putting in a drain. That solution is not only expensive, but also not a complete solution, because a drain can easily become plugged with leaves and other debris. So how about an awning over it? Traditionally, you would attach the awning to the house. That’s a good approach, but the cost and wear on the house to remove the siding, flash everything in, and make it structurally sound is not a small thing. It would be easier if there was space to put a traditional straight awning across, but the height of the window above makes that impossible. The end of the awning, by to the top of the stairs would not be high enough to easily get under. Access under the awning needs to be at least 7′, so that doesn’t work. The awning could be flat roofed and that would come close, but in Colorado with snow loads and such, that didn’t seem so reasonable either. So, out comes the practical engineering mind for design. What if the design sidestepped connection to the house? In Colorado, if the structure is free-standing and smaller than a certain size, a permit is not required. Making it free standing would also eliminate tearing up the side of the house, and I wouldn’t need to interact with the structure of the house either. When you come up with your own engineered design, make sure you use the right materials for the right job. 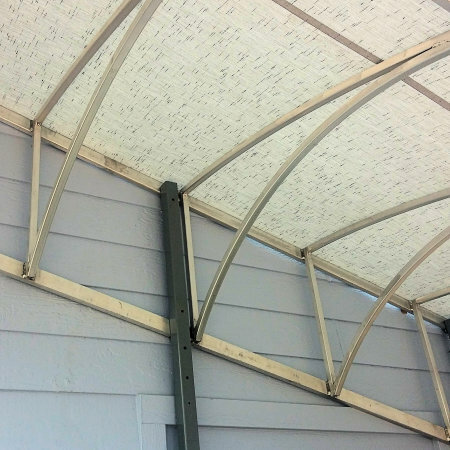 This design uses steel painted uprights, with aluminum fabric support ribs, with stretched awning fabric over the top. Simple enough. The awning is wide to avoid snow blowing in, and to keep horizontal rain out. The images show the completed installation. It’s a one-off, a prototype that uses a variety of materials. While you can’t see it in the images, the wind was whipping in these photos. The awning is a big piece, but it’s quite strong. The uprights anchor to the ground with stabilizing by the house with a couple of stand-offs. There is a touch of space between the house and the awning so that some water can come down the side of the house past the awning (so debris does not collect). Because of the compound angles, rain and snow tend to just slide right off. We get some really big hail in Colorado, too, so the fabric choice was important. That works perfect. The hail just bounces off. 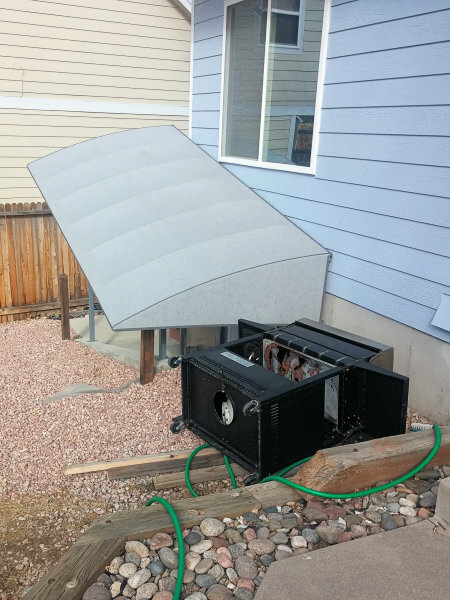 One of my big concerns was engineering design for the strong winds we get in Colorado. 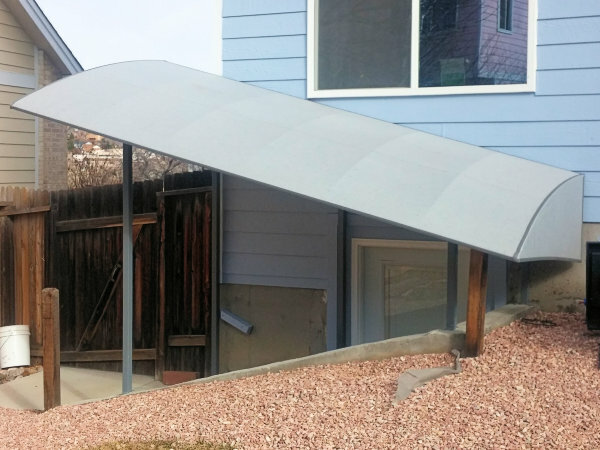 Every winter and spring, we see some really high winds — 60 mph is common, 80+ mph occasionally — and the awning looks a lot like a sail. It’s been up a few months without a problem, but has not yet been truly tested. UPDATE: Nearly 3 Years now, the awning looks just as great as ever. After one really significant wind storm a minor repair to the ground attachment was required, but no other issues. This is now a Tested Engineering Design. This morning we woke to gale force winds ripping through the neighborhood. 60+ mph the radio said. The wind knocked down fences, took out the power in several areas, and blew down trees. As you can see in the photo, it even blew the old BBQ grill right off the patio! I looked out the back and saw my neighbor’s awning fabric in shreds, so obviously went out to check mine. There it was, standing like nothing happened. Which brings a smile. The photos above are in the fierce wind. The smile comes from satisfaction in success with tested engineering design, as well as from the comments from contractors that said it wouldn’t hold, and yet, there in the huge gust that nearly blew me over, the awning didn’t seem to care. Chalk one up for successful testing with Mother Nature. We’ll call it a Tested Engineering Design, and get off to our 1 Million Cups weekly meeting!